Two days after 12 boys and their football coach disappeared inside a cave complex in Thailand's mountainous north, a team of Thai Royal Navy SEALs headed before sunrise into the pitch-black maze of muddy passages to find them. "We worked until we forgot the time," said Captain Anan Surawan, chief of the 1st Special Forces Regiment. But their day-long mission failed because, as monsoon rains lashed the limestone hills outside, Anan's men found themselves wading through rapidly rising waters and, fearing for their lives, they turned back. A week later, when British divers found the 13, hungry and huddled in darkness on a bank in a partly flooded chamber about 4km inside the Tham Luang cave, Anan realised that his team had come just 500-700 metres short of the boys that day. He realised, too, that if reaching the boys had been so complicated and perilous, extracting them would be even harder. 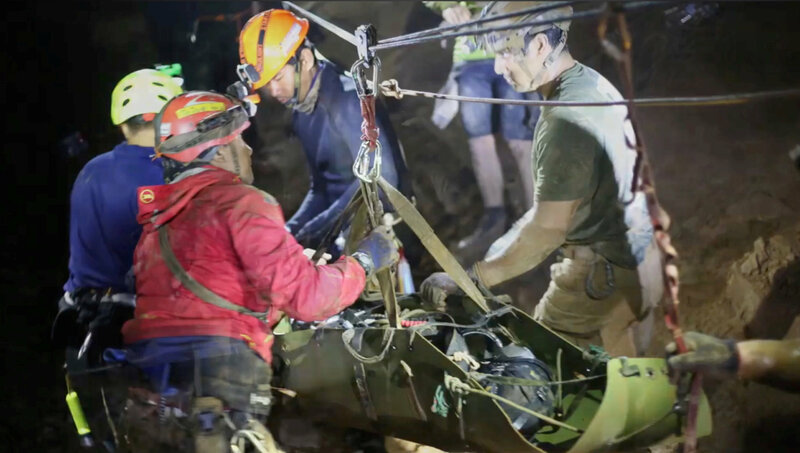 Indeed, it was nearly another week before the first of the 'Wild Boars' football team was brought out of the cave by elite divers who had, with Thai special forces, planned the rescue meticulously - but quickly, as more rains threatened. Reuters spoke to rescuers and officials to piece together the three-day operation, which - aside from grit and daring - involved a huge amount of specialised and adapted equipment and materials, including pumps, guide ropes, wet suits, masks, stretchers, torches, pulleys, oxygen tanks, space blankets, and food gels to improve their health and energy. It also involved about 90 divers in all, 50 of them from overseas as well as medics, ambulance drivers, and helicopter pilots to take the boys straight to hospital in the town of Chiang Rai. Erik Brown, a Canadian who was one of 13 foreign expert divers in a core team of 18, said he was terrified as he swam, crawled and waded through the labyrinthine cave. He recalled diving for perhaps half an hour in "zero visibility", with his helmet bashing against rocks, and then a 10-minute walk in water up to his waist before diving again. "If it rains, the water level goes up in two hours and we can't tell what the water is doing inside, so you thought you were doing a half-hour dive and now you are doing a two-hour dive, and do you have gas for that? It's nuts." Brown, a 35-year-old who runs a scuba shop on the balmy Thai island of Koh Tao, was tasked during the rescue with changing oxygen tanks and hauling the boys along between dive spots. On July 2, nine days after the boys and their coach were last seen, British divers Rick Stanton and John Volanthen pushed deep into the cave to an elevated mound of rock, about 400 metres away from a spot cavers had nicknamed "Pattaya Beach" after a well-known Thai resort. About 10pm, Volanthen emerged from the waters around the mound and shone a torch into the startled eyes of the boys. In a grainy video captured on his GoPro camera that was later shown on TV news channels around the world, Volanthen told them: "Many people are coming. Many, many people. We are the first." From then on, it was a race against time. Oxygen levels in the cavern had fallen to 15% against more normal levels of 21%. Medical experts consider 12% a critically low level. And then there were the forecasts of more rain, which meant that water levels inside the cave could rise further, making an escape impossible. Every day, about 8.30am, the international coalition of divers would come together with Thai navy commanders. Brown was impressed by the rigour of the planning by the Thai military. "I've never seen anything that's so precise or to the point," he said. The team's morale was hit when a former Thai Navy SEAL, Samarn Kunan (38), died while helping lay out oxygen tanks underground. He was the only casualty of the operation. But they pressed on and, on July 8, the rescue began. In the cavern, one-by-one, the boys were fitted with 5mm-thick wetsuits and full-face scuba masks. They were told to remain calm and motionless as two divers prepared to tug them through murky waters and along guide ropes that had been put in place. None of the children, aged between 11 and 16, were strong swimmers let alone competent divers. Some crevices were barely wide enough for a person, and the swirling currents risked ripping off the boys' oxygen masks. "The main challenge in the mission is water, which keeps coming all the time. This makes the current inside quite strong, and because it's constantly flowing the water is murky," a Thai officer involved in the mission told Reuters, declining to be named as he wasn't authorised to speak to the media. About 40% of the boys' journey through the water of at least three hours involved diving and in other parts water was up to the rescuers' chests, Thai Navy SEAL commander Rear Admiral Apakorn Yuukongkaew, told reporters on Wednesday. Once past this stretch, they reached Chamber Three, the SEALs' main base. The diving was over by this point, but still the way ahead was hard. The boys were put in green plastic toboggans and carried through: at some points, there were steep slopes with cascading waters and the rescuers had to use a pulley system to winch them up. "We didn't want the children to walk because it is really tiring from Chamber Three to the cave mouth," Apakorn said. Wet and cold, some of the boys fell asleep as they were hauled along to the exit, but there were more than 100 people stationed along this section, including nurses who checked their temperature, blood pressure, pulse and oxygen levels. There have been reports that the boys had been sedated, though officials said only that some had been given medicine to calm their nerves. "We brought the children out like eggs protected in stone," Apakorn said, referencing a Thai saying equivalent to "velvet glove". Over three successive days, the rescuers brought out four, four and five survivors, respectively, sticking to the same routine each day. "If it's not broke, don't change it," Brown said. "When day one went well, we said - we are going to do the exact same thing on day two." The Canadian, speaking to Reuters a day after the rescue ended, said he had no plans to dive again anytime soon. "I was exhausted," he said. "I'm looking forward to staying out of the water for a bit. I've got a beer in my hand, I'm going to enjoy this, then I'm going to fly home and sit in a hammock for a few days."